Plan of Aldgate Ward with its Divisions into Precints and Parishes from a New Survey. Plan of Lime Street Ward Divided into Parishes from a new Survey. Plan of Queen Hith and Vintry Wards Divided into Parishe, from a New Survey. An uncommon and appealing c. 1780 ward plan of parts of London, England, by Alexander Hogg. Essentially three maps in one, this chart covers, from top down Aldgate Ward, Lime Street Ward, and Queen Hith and Vintry Wards. The Aldgate Map is centered on Aldgate Street (Frenchurch Street), and covers from Leaden Hall Street to Curtched Fryers. 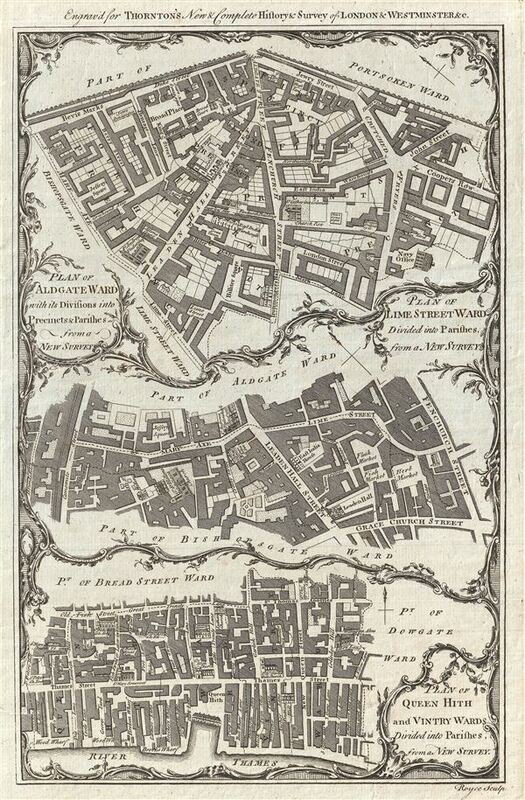 The Lime Street Map is centerd On Leaden Hall Street and Covers from Camomile Street along St. Mary Axe and Lime Street to Frenchurch Street and Grace Church Street. Centered on Thames Street, the Queen Hith and Vintry Wards Map covers the lands between Old Fish Street (Great Trinity Lane) to the Thames River, and from St. Peter's Hill to Dowgate Ward. All three maps show important buildings, roadways, some topographical features, and various precincts. Engraved by Alexander Hogg for publication in the Thornton's New and Complete History of London and Westminster.